We are a leading Manufacturer and supplier of Conveyor Reflow Oven. 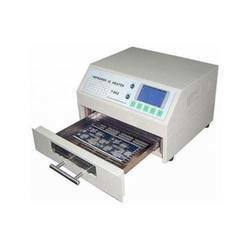 Our offered products are Automatic Solder Paste Printer, Pre Owned PCB Soldering Machine and Pre Owned Glue Dispensing Machine. Enriched with immense industrial knowledge, we are engaged in offering a technically updated variety of Infrared Economical Reflow Oven that is highly demanded among the patrons for easy operations and high functionality. In their fabrication process world-class quality of raw components are used and these products are available with us in standard and also in modified forms. Moreover, offered products are quality proved in nature and are given as per the requirements of our valuable clients. The INFRARED IC HEATER T962 is a micro processor controlled reflow-oven. It can be used for effectively soldering various SMD and BGA components. The whole soldering process can be completed automatically and it is very easy to use. This machine uses a powerful infrared emission and circulation of the hot air flow, so the temperature is being kept very accurate and evenly distributed. A windowed drawer is designed to hold the work-piece, and allows safe soldering techniques and the manipulation of SMDBGA and other small electronic parts mounted on a PCB assembly. The T962 may be used to automatically rework solder to correct bad solder joints, remove / replace bad components and complete small engineering models or prototypes. A large infrared soldering area Effective soldering area: 180×235mm, this increases the usage range of this machine drastically and makes it an economical investment. Choice of different soldering cycles Parameters of eight soldering cycles are pre defined and the entire soldering process can completed automatically from Preheat, Soak and Reflow through to cool down. Special heat up and temperature equalization with all designs Uses up to 800 Watts of energy efficient Infrared heating and air circulation to re-flow solder. Ergonomic design ,practical and easily operated Good build quality but at the same time light weight and a small footprint allows the T962 to be easily bench positioned transported or stored. Large number of available functions The T962 can solder most boss-eyed or double-face PCB boards small parts, for example CHIP,SOP,PLCC,QFP,BGA etc.It is the ideal rework solution from single runs to on-demand small batch production. We are a well-known name in the market in offering a wide range of Reflow Oven T960. This is equipped with the crawler-type and five temperature area heating systems, and each temperature area uses independent PID controlling and up-down heating type, can make the inside temperature more accurate and well-proportioned. Moreover, offered range of products is tested on various parameters to follow the ongoing market trends. We assure timely delivery of our offered products. This machine selects the intelligent level sirocco and rapid infrared heating technology controlling, equipped with special design wind wheel, speed stability and uniform temperature, suit for uninterrupted soldering the LED and BGA components. This machine is equipped with the crawler-type and five temperature area heating systems, and each temperature area uses independent PID controlling and up-down heating type, can make the inside temperature more accurate and well-proportioned, just take about 15 minutes can let it heat up to the working temperature from the room temperature. Intelligent temperature wave heating type, oversized capacity wave selection, has eight temperature waves can satisfy various welding technological requirements. Use programmable technology, preset the temperature wave memory storage function, can complete the whole welding process automatically according to your presetting wave. Adopt the thermocouple temperature measurement and add the compensation circuit, make the temperature measurement more accurate, the wave more perfect. Use PID intelligent temperature control technology; make the temperature control more accurately. Adopt the imported large current solid-state relay non-contact output can effectively avoid the IC or circuit board damage due to the rapid or uninterrupted warming up, make the whole welding process more scientific safety. Transmission system adopt imported frequency conversion motor, PID closed-loop speed, equip with all the import 1:150 turbine speed reducer, smooth operation, speed adjustable range 0-1600mm/min. Adopt independent wheel structure and special stainless steel strut, durable wear-resisting runs smoothly, speed precision can reach + 10mm/min. Independent cooling zone, to ensure the PCB board of low temperature when the required. Friendly human-machine operation interface, perfect LCD display, no need to connect with the PC, can watch the whole repairing process very clearly. Ergonomic design, practical and easily operated. Good build quality but at the same time light weight and a small footprint allows the T-960 to be easily bench positioned, transported or stored. Looking for Reflow Oven manufacturer ?